Hopefully summer has started well for all of you! 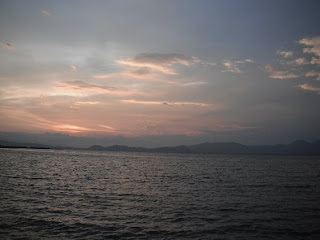 I have noticed that the blogging has slowed due to summertime. Keep posting! But not to worry next school year and possibly before then the blog will be back to its normal intensity. I am looking forward to becoming a Lefty's editor in the fall and doing my best to keep the site growing. A lot has been accomplished, but we are only just getting started! This summer I am in Masaya, Nicaragua following in the footsteps of Lefty's founder Henry Vasquez. While Henry worked in Microfinance, I am doing a "Youth and Education Internship" through the Foundation for Sustainable Development. FSD has placed me with an organization in Masaya named Asociación Masaya Sin Fronteras (MASINFA). Notre Dame offers scholarships to various international internship programs through the Kellogg Institute (http://kellogg.nd.edu/students/internship/index.shtml).It is criminal to be a ND student and not take advantage of these kind of opportunities! Start looking into it. My first couple of posts will be more description based, but as I spend more time in the country I plan on getting much deeper into analysis of the country and my experiences. Below is my first post since arriving in the country. The six interns in my group, and one of our FSD directors. It is Tuesday and I am finishing my 3rd day in Nicaragua. I am spending my first week in Ciudad Sandino, Nicaragua. 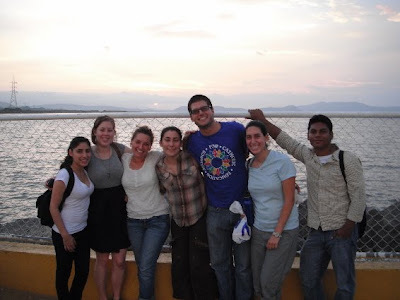 There are a total of six interns in the Ciudad Sandino region of Nicaragua beginning their summer session this week. Each intern is a student, four from California (University of San Francisco), one from a school in Ohio. It is good to have company to share my experiences with for the first week. Out of this group I am the only one going to Masaya, but there are two college students from the U.S. interning there now. I am writing this from the kitchen table of a wonderful family. It is a young couple with a 9 year old son. The hospitality here is truly on a different level. The family has been extraordinarily welcoming, and the food incredible! * I will do a future post about the food* It has been fun connecting with their son Jose Angel. We have played soccer in the back patio the last two nights. Both nights I have redefined sweating. While a thermostat may say 80-90, the humidity is more than I have ever felt before. 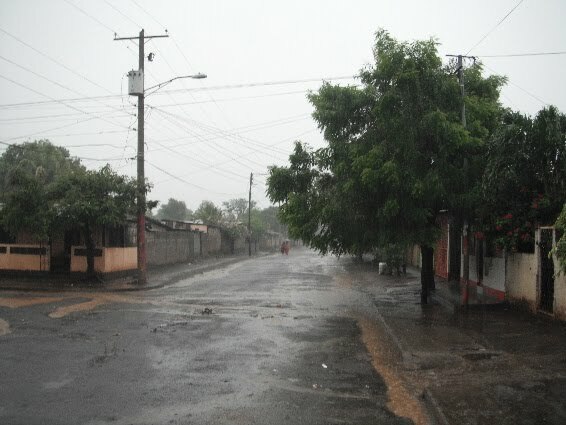 The rainy season is generally from May to November, so there has been some rain, and I expect a lot more. The street outside the house for my first week in the rain. In my first night in Nicaragua I left Ciudad Sandino to have dinner with a very good friend from Notre Dame who is from Managua. It was a bit of an adventure finding her, an early indication of how different it is here than the U.S. Nicaragua does not have official addresses. So on fully paved streets an address is still given based on landmarks and descriptions of the general area. For example, my address in Masaya is “3 and a half blocks south of where the courts (judicial) used to be.” One of the FSD employees set me up with a cab and before we left I sat there and listened while my friend Alejandra kept giving different landmarks until he recognized one. The first song in the cab was “poker face” by Lady Gaga, oohhh how U.S. culture spreads to the world. Certainly provided for a moment of reflection, listening to a song I would hear in a cab in South Bend, while I am in such a foreign place. In conversation with my cab driver I discovered that soccer is extremely popular here, but baseball is the heart of Nicaragua!! I will be sure to catch a couple of games here during the summer, and hopefully I will be able to play once I get comfortable in Masaya. Seeing Alejandra in Managua was a blast. Unfortunately, she left on Monday for New York for the summer. But maybe it is a blessing that will keep me stretching my comfort zone! Her family was persistent in letting me know that if I ever needed ANYTHING to let them know. Thank you Notre Dame for allowing me to meet such quality people! I can already tell that my experience with Spanish this summer will be an inexhaustible tug of war. In my first three days I have found myself all across the emotional spectrum with the language. Each day we have had a series of speakers explaining their expertise on a particular element of life and culture in Nicaragua. We have learned about the economy, the health care system, politics, and various elements of the culture. Today I was excited to have understood nearly all of the doctor’s explanation of the health care system here, only to be severely let down by my inability to comprehend a long and vivacious presentation on Nicaraguan politics, by a local (feminist) activist. I understood her passion and frustration, but failed to comprehend a lot of the details of her explanations -- missed opportunity. When I am talking with native speakers I find myself desperately searching for alternative ways to verbalize my thoughts, the struggle of a 21 year old brain and 1st grade vocabulary. My frustration motivates me to learn, but the incredible feeling of being able to successfully communicate at times is driving me to be persistent in learning vocabulary. 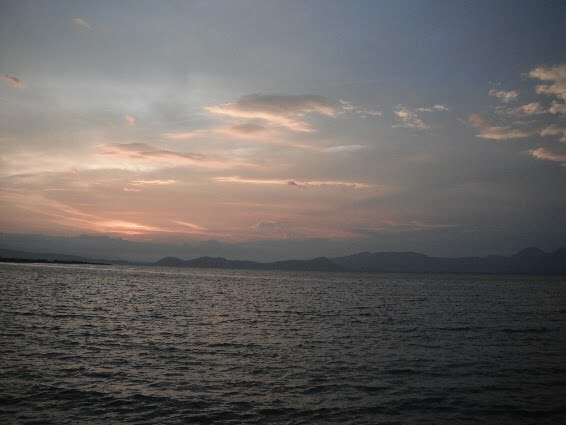 View from the pier in Managua. The best experiences so far have been without a doubt our daily “habla nica” activities. We take breaks from presentations and get an assignment that we have to carry out in the “mercadito.” The market is made up of roughly 100 small shops and street vendors. Our assignments have been to discover elements of Nicaraguan life and culture, like Nica words that are different than traditional Spanish, or popular meals and drinks. Yesterday, we were given 2$ to represent the daily wage of a person at the poverty line according to the World Bank (roughly 40% of Nicaragua), and asked to buy food for a family and make economic choices based on hypothetical family needs. Lesson learned: 2$ a day is not enough for anyone to be able to break the cycle of poverty, the family can be fed but any other expenses mean little or no food for a day.